Long, long ago, in a land far away, I used to be a teacher. Daily I would stand in front of groups of teenagers and read novels, answer math problems, and extol the benefits of having a good, thick cell wall. Sure there were challenges in keeping their attention and getting them to listen, but on the whole it wasn’t so bad. Generally, if the content was interesting, the students were interested. But that was about 5-6 years ago, and I wonder what it’s like now. I recently read an article from the Pew Research Center describing mobile phone adoption and use in the US. The article’s highlights are staggering (at least to me): the ‘average’ American teenager sends and receives 50 text messages a day – that’s 1,500 a month; while 31% send and receive over 100 a day – that’s 3,000 a month! After mentioning this to a woman I work with, she just knowingly nodded her head. Her daughter averaged 4,000 texts a month. That’s right *four thousand*. I’ve long wondered what kind of impact this has on a person. What effects that volume of stimulus has on someone day after day after day. Of course there’s a loud chorus of arguments telling us that these kids are better multi-taskers, that they’re better connected to their social groups, that texting isn’t essentially different than email or it’s analog predecessor – the telephone. And although these arguments are plausible, they don’t sit well with me. Participating in 4,000 interactions in a single month (133 per day) has to have real consequences somewhere else down the line. How can you really concentrate on your work when you’re waiting for the phone in your pocket to buzz? How can you watch the news? How can you concentrate for long enough to even send or read an email? My theory is that you can’t. The primary consequence as I currently see it is widespread and irreversible – it’s a fundamental shift in the nature human language. Just as the printing press, the telegraph, the telephone, and indeed the internet have marked turning points in the nature of our language, the text revolution is doing the same thing. In the coming years, whole generations of young people will grow up without having to (or being able to) read and write more than 50-100 words at a time. If we think that printed media is dying now, just wait for another generation or two to turn over. I can’t imagine what it must be like in a classroom today. Staring out at a sea of 25 teenagers, all waiting for the pocket in their skinny jeans to start to buzz; all waiting impatiently for text 87 of 133. In the couple of years since I’ve worked at the hospital I’ve been watching a man in the cafeteria quickly climb the corporate ladder. When I first started, I remember seeing him going around emptying garbage bins, wheeling around a large, noisy, rickety gray plastic tub that he would take to the dumpster when full. Every few garbage bins, he would stop at a table and have a quick chat with someone he knew. Given that he knew someone at almost every table, the work was slow going. A few months later I saw that he’d been upgraded to sweeper, where work primarily involved hours of pushing around a long, rectangular broom. Gaining a wider perimeter with his new task, he was running into way more people than before, and subsequently, getting less and less sweeping done. Very soon after that he was bumped up again; this time he was serving coffee at the Tim Horton’s line, though again with the same result. Almost every second or third customer that came up to get a coffee would be asked what they did the weekend, or if their sister had her baby yet, or if their grandmother was getting discharged. Predictably, his coffee line was at least twice as slow as the others. Within another few short months I saw him make his latest job upgrade—this time I spotted him behind the hot food serving line. No longer attired with dark-blue maintenance staff uniforms, nor with light-green hospital scrubs – instead he had on a clean, crisp, white chef’s jacket, and starched black pants. He’d arrived. In just about two years, he’d gone from garbage bin empty-er, to floor sweeper, to coffee server, to cook. That’s four jobs in just two years! Best of all, in each of those previous jobs he was borderline unproductive—spending a good proportion of the day waving, winking, hand-shaking, and working hard at the hi-how-are-ya. How did he keep getting promoted? Easy as pie: he just had to be himself. The part I’ve hinted at, but haven’t told you yet is that this guy is the kind of guy that you love to run into—the kind of guy you’d love to be friend’s with. He’s always happy and smiley, endlessly hopefully and unbelievably optimistic. In short, he’s the kind of guy who makes you smile when you see him. Incidentally, this is precisely the kind of guy you’d want to hire and have on your team. Every time you see him he’s either whistling or singing; laughing or telling a joke. He’s got an infectious positivity. I’m not trying to suggest that whistling and singing were the keys to this guy’s career success—for all I know the man is a Michelin starred chef. Even so, I’m sure that his over abundance of positivity and optimism have done him no harm along the way, and I’m certain that his productivity should be measured in more ways than floors swept or coffees served. An excellent example of how most writing-centric websites should be: comment free. 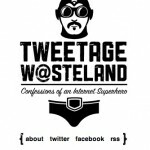 Tweetage Wasteland is a wonderfully well written curation of where we are with our shiny new digitized lives. Although the careful, thoughtful commentary is enough to justify frequent visits, the fact that comments aren’t enabled adds something extra: authority. Very few of the 17,000,000,000 blogs out there are able to pull off anonymous commenting. Outside of the spam, the trolling, and the inane (and often irrelevant) observations, the filler never boils down to much killer. The idea for this post actually came from a wonderfully useful Teehan+Lax post. At the time writing, there’s hundreds of comments, retweets, reblogs, and pharmaceutical shout-outs to read through at the bottom of this page. What value does it add? Swing by Teehan+Lax first and have a look at the mess they’ve created, then have a look at Tweetage Wasteland and see how you fell when you’re done. Although this website was only technically launched in 2010, the first post was written in late October, 2008! Even though it’s not even published for public viewing, it’s still there, reminding me of how long I’ve put this website off. I’ve tried in various ways to live in a more publicly accessible way: I’ve participated in several tech/photo forums; I’ve opened accounts on every single social networking site to come along in the last 5 years (including Flickr, Facebook, Tumblr, Ning, etc, etc), and I’ve tried, albeit unsuccessfully, to maintain some kind of persona online. In the end, all of these efforts have failed because I never really invested in them. I found Flickr too onerous, Facebook too pointless, Tumblr too limiting, Ning too poorly designed. The real reason why all of these endeavours have failed, however, wasn’t because of their individual limitations. It was because somewhere in the back of my head I always knew I wanted to host my own personal site. I always felt like I was wasting my time maintaining these other sites, when I knew I’d eventually have my own space – some kind of special, Shangri-la-like terrysutton.com where there would be reams of cool content and abundant traffic on launch day. What I’m only coming to realize now is that by thinking that way I was only enabling procrastination. I could have easily built a presence online with any of the tools mentioned, but I didn’t. Instead, I waited and waited; I tried Tumblr, hosted WordPress, Joomla, and eventually Drupal, thinking that the *tool* was preventing me from building a website. But that just wasn’t the case – the various tools were enabling me putting off actually getting it done. Give yourself a firm, stress-inducing timeline – for example: In two months, I promise will have this much done. No matter what. Be it a logo, a layout, a blog feature…whatever. Just give yourself a timeline and get it done. Break things up into small chunks. Conveniently, the first rule helps with this. If you break things up into smaller pieces, they’ll be easier to get done. In very practical terms, what this might mean for your project is getting a single component out there. If you’re a photographer intending to build an online store for your photos, launch a blog first. A blog is easy to build, will force you to think about content, design and branding, and will get the marketing ball rolling. Next, add a gallery feature to display your photos, and maybe after that add the online ordering. You’re best off to start with tiny little pieces that you can launch quickly. Get some momentum rolling and you’ll be able to feel confident that you’re actually getting something done, rather that just work on a huge, never ending project.